MCM Services’ unique and custom-designed porches and decks provide homeowners with a one-of-a-kind look designed to fit your lifestyle and needs. We design each project individually and make the end result interesting and functional with consideration of the architectural detail of your home. Our porches and decks are constructed using a variety of material options to create an attractive outdoor living area that will stand the test of time and add solid value to your home. 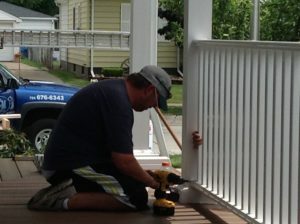 Call today and allow one of our helpful professionals show you samples of our quality porch and deck designs.